Apple menu () > System Preferences, then click Displays. 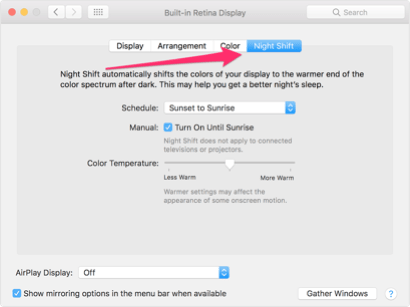 If automatic brightness is enabled on your Mac the screen will also be dimmer if the ambient light is not as strong which can make your eyes even more strained. Already own an iPhone or iPad? 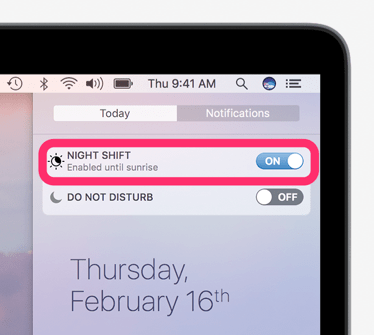 you may have already come across this feature, basically Night Shift changes the color output toward the red side of the color spectrum. This reduces the harshness from the blue light coming from the screen which is supposed to disrupt sleep patterns. Night Shift can be switched on at any time of day or you can use a timer if unlike me you have a fairly steady schedule!